Aesthetic dentistry or cosmetic dentistry is sometimes viewed as less important than regular dentistry. Getting your teeth cleaned and your cavities filled is the necessity; making your teeth look good is just a luxury, right? Wrong! 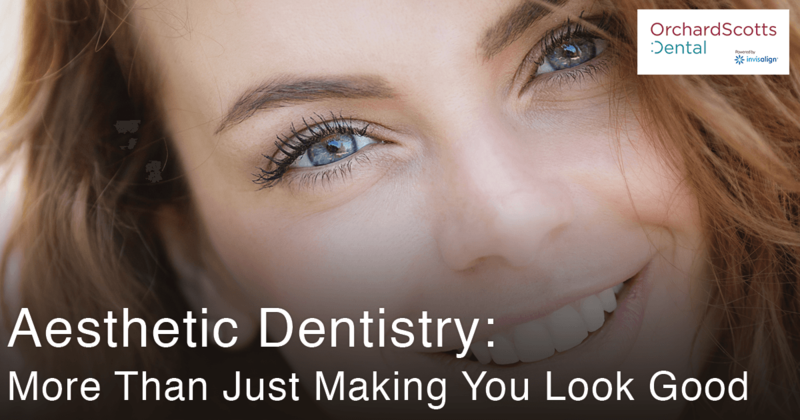 Aesthetic dentistry is about so much more than nice-looking teeth, although that is part of the process. This kind of dentistry can actually improve a person’s health and wellness by correcting severe issues related to the patient’s bite and their jaw alignment. Did you know that over time, a misaligned bite can actually cause changes to the skeletal structure of your mouth and face? If the contact points in your mouth are insufficient or in the wrong places, your face can gradually become more and more asymmetrical as you are forced to bite differently to compensate for teeth that aren’t functioning correctly. If your top front teeth overlap your bottom teeth, you have an overbite. It’s a common occurrence, and many people have them; it’s only when the issue is severe that it causes physical damage. An extremely pronounced overbite with a sizable gap is often labeled a deep bite, and it can cause your teeth to wear down unevenly or give you pain in your jaw. Invisalign clear aligners and other aesthetic dentistry treatments can correct the issue and restore a healthy balance to the teeth. Aesthetic dentists in Singapore and other countries may use the clinical term prognathism to refer to this type of malocclusion. An underbite happens when the bottom teeth jut out and overlap the top teeth. Besides being very unsightly, this problem can cause the patient significant discomfort. If you have a distinct underbite, you may have trouble biting and chewing food correctly and speaking clearly. You may also suffer joint pain and jaw pain which can trigger headaches or pain in the ears. Your teeth may wear down in places. With Invisalign and a good cosmetic dentist in Singapore, like the team at Orchard Scotts Dental, the underbite can be corrected and you can enjoy the function and feeling of a normal, comfortable bite. Anytime there is an unusual spacing of the teeth, you run the risk of developing gum problems and your chances of periodontal disease increase. Your other teeth may shift, trying to fill up the space, and you may have an uncomfortable bite, depending on where the gap is. Invisalign can help straighten out your teeth and close any small gaps; and if a tooth is missing, your Singapore dentist at Orchard Scotts Dental can make a little extra space so that a dental implant may be inserted. If your teeth are crowded together inside your mouth, you need Invisalign and some related dental treatments to correct that issue. The crowding of the teeth makes it tougher to floss adequately and harder to brush your teeth, which means that your risk of plaque, tartar, cavities, gum problems, and tooth decay increase. Taking care of the problem isn’t merely an aesthetic choice— it’s the right choice for your oral health. Common issues like Temporal Mandibular Joint Disorder (TMJ), crossbites, and other oral problems may affect your lifestyle in many ways. You may not even be aware of how much you are having to compensate for your crooked teeth or misalignment. Instead of struggling along with these issues, why not visit Orchard Scotts Dental? We’ll help you design a treatment plan that corrects your teeth and restores your dental health.